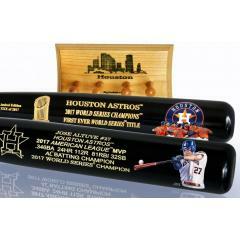 Here is an exclusive opportunity to add a unique, two bat set honoring the World Champion Houston Astros to your championship season collection. 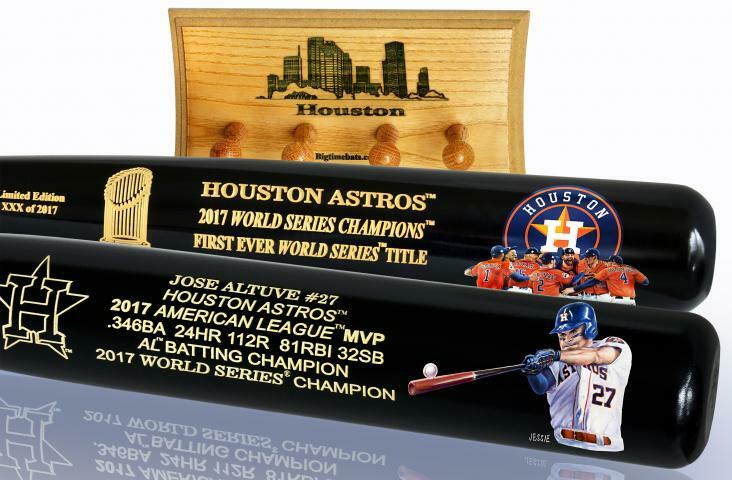 This special, two bat set features one (1) Jose Altuve AL MVP Art Bat, one (1) Houston Astros Championship Celebration Art Bat, and one (1) custom Houston Skyline Two Bat Display Rack. These full size bats feature the talent of artist Jolene Jessie, and would look great displayed on any wall in your home or office. This set is priced to include your Skyline display rack FREE of charge. Order your set before they are gone. Due to the limited nature of this offer we must charge your credit card for the full price immediately upon taking your order. This policy ensures we reserve a set for you. We will confirm your order by Email. These bats are not game used. Please allow 4 to 6 weeks for delivery.